I almost didn’t rate and review Band of Brothers, as it’s a mini-series, not a film. But then again, so is Lonesome Dove, technically, but some made-for-TV series just have that movie feel, so I’m making the call and I’m reviewing this ten-episode set. It helps that it’s phenomenal, a stunning piece of history laid out like a present for audiences to unwrap, and it leaves the television aspect at the door walking in, slamming shut any notion that it might just be some episodic attempt at drama that ultimately falls woefully short. This is perhaps the most powerful war story ever told, aside from Saving Private Ryan, with which it shares many similarities, and alongside which forms an unbeatable, near-perfect duo. During the American involvement in WW2, E Company of the 101st Airborne Division was among the most active and heroic groups in the entire global theatre. They trained as paratroopers, and their first mission was to drop behind enemy lines in support of D-Day, taking out German guns that were pointed at the young men storming the beaches. From there, Easy Company would take the city of Carentan, begin the infamous Market Garden campaign, defend the forests of Bastogne, liberate a concentration camp, storm Hitler’s own mountaintop retreat, and watch the war in Europe come to a violent end. The Second Great War raged on in many different parts of the world, but the 101st was always there in the thick of battle, writing history with their blood. 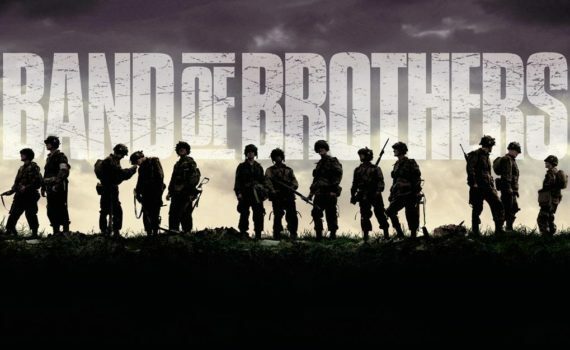 If you’ve seen Saving Private Ryan you know what to expect from Band of Brothers. This is a true story version and a look from a different point of view, but it has the same feel and follows a similar timeline. That’s not to its discredit, it’s just more of a story I want to hear more from, so bring it on. Tom Hanks & Steven Spielberg, who teamed up for SPR, were executive producers for this series, and Hanks even directed & wrote an episode. The tactics, the jargon, the battles, the bonds, the turmoil; it gets me, and I know I’m not alone, this is extremely powerful stuff. It was an era when the fate of the world was literally being decided, and I don’t think that importance can be overstated. As far as the series goes, it’s incredibly acted by its leads, and then there are the multitude of stars who made appearances: Tom Hardy, Michael Fassbender, James McAvoy, Colin Hanks, Jimmy Fallon, Simon Pegg, David Schwimmer. It’s a shocking list, it’s a moving drama, and I can’t recommend it enough to anyone who is interested in history, film, and high quality entertainment.